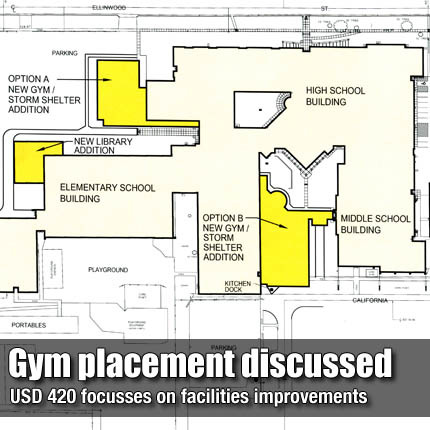 The USD 420 Board of Education is exploring one of two options in the planned addition that may move construction of the new gym and storm shelter to between the main gym and middle school. OSAGE CITY—The USD 420 Board of Education held a special meeting June 27 to discuss two major pieces of the school improvements projects approved in the April bond election. The board moved by consensus to explore the second of two options in the layout of features in the improvements project, in particular, the new gymnasium and FEMA shelter. Kenton Cox and Shannon Bohm, of Schaefer Johnson Cox Frey Architecture, brought two design options, both of which retained all items presented in the bond issue, in addition to retaining usability of the elementary school gym. Option A keeps most of the design presented during the bond issue, but adds a corridor along the south wall of the elementary gym for access to the new gym and storm shelter. The locker rooms are currently located near the existing middle school gym, and would not be moved to the new gym in that option. USD 420 Board Member Todd Peterson also expressed a concern with limited access to the shelter. The second of the two options places the new gym in between the existing high school gym and the middle school. A corridor would be completed, connecting the existing gym, new gym, middle school and cafeteria. It would create a closed atrium between the schools. “Option B” stemmed from conversation at board meetings following the bond election. The placement of the gym to the east of the high school gym solves several issues, including a drainage problem that had flooded the high school gym shortly after its construction. It also preserved existing parking to the northwest of the schools. With option B, food deliveries and trash removal would have to be taken down a hallway to the south entrance of the school. Both option move the weight room and fitness area from the elementary gym to the middle school gym. Cox said this area could be utilized in a number of different ways.